This past summer Hugh Farrar traveled to Quebec, Canada for two weeks to fight forest fires with the Maine Forest Service. Hugh graduated in 2013 from Houlton High School. 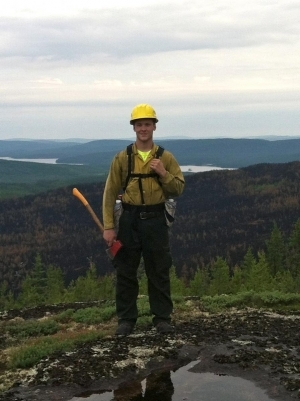 While at Houlton he attended Region Two for Forest Management and Operations for two years. While in Forest Management he had the opportunity to obtain his Forest Fire Fighting “Red Card” from the Maine Forest Service. Hugh said traveling to Quebec for work was a great experience and recommends other students get their “Red Card”. He is now attending the University of Maine at Fort Kent for Forest Technology using the articulation agreement made available from UMFK and Region Two. Region Two announces Region Two CTE Student of the Year – Houlton Pioneer Times news article. Region Two SkillsUSA Chapter Brings Home the Gold!